Beyonce returned to her home town of Houston, Texas, to help those affected by Hurricane Harvey. Thousands of people were left homeless and dozens died following flooding caused by the hurricane last month. The singer was seen handing out food to survivors, along with Destiny's Child band mate Michelle Williams and mum Tina. The moment was captured by videos posted on Instagram by Tina. In the post, Tina said: "That's Michelle Williams at the beginning of line, serving the chicken, Beyonce on Green beans and me on bread duty." In another video posted by Tina, Beyonce is seen speaking at St. John's United Methodist Church in Houston where she says the day was "a celebration of survival". In the post Tina said it was a "touching moment" for her being back at the church where Beyoncé sang her first solo as a 14-year-old. 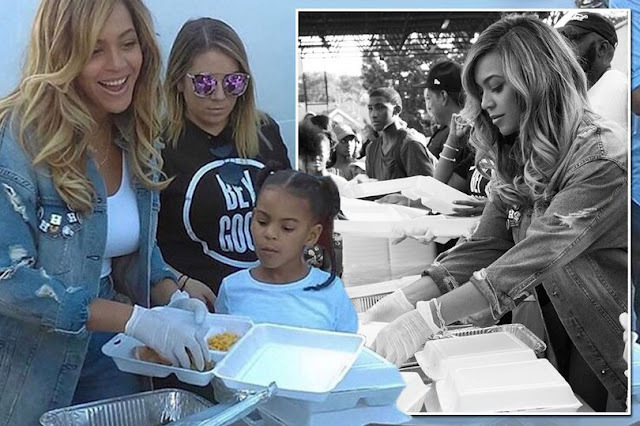 The volunteers are all seen wearing t-shirts with the 'BEYGOOD' slogan - Beyonce's charity which provides clothes, food, shelter, healthcare, jobs and counselling to those in need. The pictures emerged a week after actor Kevin Hart publicly told Beyonce to get donating to her storm-ravaged home state of Texas. Kevin coughed up $25,000 and urged Beyonce and others including her husband Jay-Z , Justin Timberlake and The Rock, to stick their hands in their pockets. But Beyonce's pastor, Rev. Rudy Rasmus from St. John's, said he was working with Beyonce - who was raised in the city’s Third Ward - to help gather supplies so that when they rain finally stops, essentials could be dished out to those in need. And yesterday, they did exactly that. Just a fortnight after Hurricane Harvey, Americans are buckling down for more destruction and devastation to be caused by Hurricane Irma.